We prefer to take a conservative approach here at Glow Family Dental, so while we’re able to fix pretty much any dental problem you can imagine, we’d much rather prevent them from happening in the first place! That’s why we offer such a long list of services designed to stop issues before they even start. With just two preventive appointments each year, we’ll make sure you and your loved ones never have to deal with pesky cavities or gum disease. To schedule your next dental appointment with us, give us a call today. Why Choose Glow Family Dental for Preventive Dentistry? Whether they are 3 or 103, we recommend that patients of all ages should receive at least two checkups and cleanings each year. Many oral health issues don’t present any symptoms during their initial stages, but Dr. Martinez will be able to spot any problem early so he can take care of it right away. And, a dental cleaning can help eliminate plaque and bacteria from those areas of your mouth that your brush and floss can’t reach at home, plus it will break up minor surface stains to keep your smile nice and white! Do you regularly wake up with a sore jaw or headache? If so, then you may be suffering from bruxism, or unconscious teeth grinding during sleep. This can severely wear down your smile if left untreated, but we can easily take care of the issue with something called a nightguard. 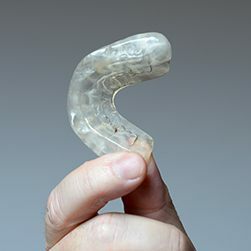 It’s a small, custom-made oral appliance that places a thin but strong barrier between the rows of teeth to prevent any harmful contact during the night. Oral cancer’s initial symptoms can be very subtle and easy to miss, leading many patients to not be diagnosed until the disease is quite advanced. Early detection and treatment are essential to overcoming oral cancer, which is why we perform a thorough screening at every checkup. We’ll examine your mouth for any suspicious growths or sores, and if we find anything, we’ll help you quickly get the follow-up care you need without delay. 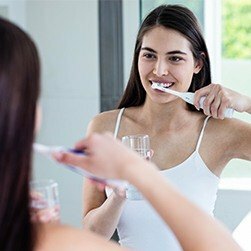 For decades, research has shown that regular exposure to fluoride is an effective and natural way to strengthen the teeth as well as reduce a person’s risk of developing cavities. That’s why it’s so often added to toothpaste and public water sources. To give our patients an extra weapon in the fight against tooth decay, we can provide a topical fluoride treatment during routine checkups. It’s fast, painless, and one of the best ways to keep smiles of all ages cavity-free between appointments. There is literally an endless variety of oral healthcare products on store shelves today, but which ones are best for you and your family’s smiles? Rather than listening to some ad campaign, the team at Glow Family Dental will be happy to recommend which products are best for you and any smiles you have at home. We can even provide a few prescription strength products that you won’t find on store shelves! We just love taking care of entire families here in Duncanville, meaning any little smiles you have at home are always welcome to our practice. Our friendly team will help your child feel comfortable starting at their very first visit, and we’ll provide the age-appropriate services their growing smile needs. We’ll make sure neither you nor your child ever have to dread going to the dentist! When it comes to your dental health, the condition of your gums is just as important as your teeth. If we notice that you have red, swollen, or tender gums, then we can take care of this part of your smile as well. We can eliminate bacteria with a special deep cleaning and lower your risk for reinfection with targeted antibiotic therapy, ensuring your entire smile stays healthy and strong. If you or a loved one are in need of urgent dental care, rather than spending hours waiting at your local ER, we recommend you simply give Glow Family Dental a call. We’re ready to accept emergency patients, and we’ll be able to see you much faster than your average emergency room. When you contact us with an emergency, our team will give you first-aid tips over the phone, and we’ll schedule a same-day appointment so that Dr. Martinez can see you as quickly as possible. Does going to the dentist make you or your child feel a little nervous? If so, there’s no need to feel bad about it, and our team will be more than happy to accommodate you. 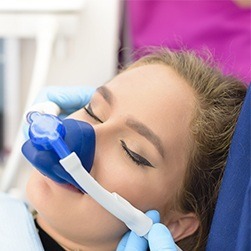 With nitrous oxide (laughing gas) sedation, we can help calm any unwanted thoughts and protect a patient from feeling physical discomfort at the same time. It only takes minutes to work, and once an appointment is over, its effects wear off very quickly, allowing a patient to go straight back to their day. Does your jaw hurt whenever you move it? Do you constantly have headaches or migraines and don’t know why? The underlying cause of both of these problems could be a TMD, or temporomandibular joint disorder. The TMJ, or temporomandibular joint, is the set of hinges that connects your jaw to the rest of your skull. 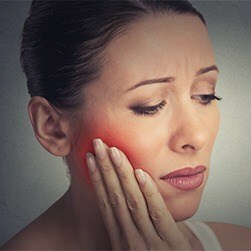 Issues in this area can cause pain throughout the face and neck, but Dr. Martinez has the know-how to identify and treat these issues right here at Glow Family Dental.